If you’re reading this, chances are you have recently come across contaminated and unsafe water running in your household, which can only be purified through a reliable filtration plant. There are two options for you to filter the contaminated water into a safer and usable alternative. You can either choose to install single-use filters at every tap or install a whole house filtration system. If you’re looking to purify water for the consumption of your entire house, it is advised that you go for whole house filtration systems that are both, durable and efficient. With whole house filtration systems, there are many factors to consider before you actually buy one. This guide aims to equip you with the necessary information to ensure you make the right decision. What Are Whole House Water Filters? Who Needs a Whole House Water Filter? Reduces sediment, chlorine taste and odor, lead, mercury, pesticides and more. The Aqua-Pure House Filtration System features durable, corrosion resistant materials with a steelhead that comes with a 25-year warranty. With an easy installation process, and FDA compliant material construction, the 3M Aqua-Pure is priced considerably lower than competitors. Coupled with the fact that it is long lasting and durable, it surely provides the best value for money. When it comes to most features and durability, the 3M Model AP904 system is the same as AP903. However, this version features scale inhibition, which uses polyphosphates in small quantity to bind calcium and magnesium hardness minerals, preventing them from precipitating out and building up on metallic surfaces. Polyphosphates also coat metal surfaces to inhibit corrosion rendering it best for hard water. Home Master’s mid-price offering ensures your water is cleaned for iron, manganese, sulfur and other contaminants in a three-stage filtration process: sediment filtration, heavy metal filtration, and chemical filtration, respectively. The Home Master HMF3SDGFEC also works best for well water. After decades of relying on well water as one of the most pure and clean sources of natural water, well water has been found to contain harmful contaminants such as bacteria, magnesium and iron. The Home Master HMF3SDGFEC uses heavy metal filtration to remove iron and magnesium, whereas the 1 micron filter openings ensure 99.99% of the bacteria is eliminated. Home Master follows up in this list of whole-house water filtration systems with its 2-stage ‘fine sediment’ filter. It includes Catalytic Carbon which provides maximum protection against chloramine affected water. While activated carbon (which is commonly found in water filters) does partially eliminate chloramine, catalytic carbon eliminates the majority of it, making it one of the best for chloramine purification. With four gradient density filters and coconut shell carbon blocks, the Home Master 2-stage filter is one of the best available in the market. After success in reverse-osmosis systems, iSpring launched its 3-stage house filtration system that features acclaimed NSF certification for purity and back-to-back coconut carbon shell block. Featuring lifetime tech-support as well as a 30-day money-back guarantee, iSpring ensures customers’ peace of mind. While most multi-layered filtration systems can only filter partial lead, iSpring’s lead filter ensures maximum lead purification, making it the best lead filter. Filtrete’s High-Performance filtration system comes in with a convenient, mess-free design that enables it to clean your home’s water supply of harmful substances. All at a price that makes it the best budget choice among house filtration systems. Aquasana’s 1 million gallon filter is one of the very best, if not the best, whole housing filters available in the market. Consisting of a unique design and Aquasana branded dual tank filter design – the Aquasana Rhino – the filter house exceeds NSF standards for purification and our expectations alike. Pro kit features three optimized filters that clean chlorine, metals as well as pesticides, herbicides, etc. 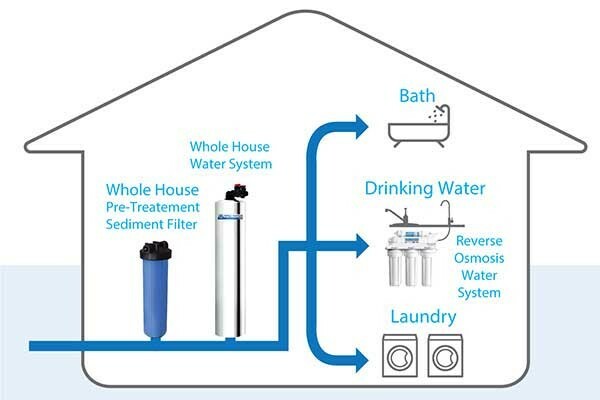 The 3 stage home filtration system is Express Water’s premium housing water solution that aims to purify the water of virtually every harmful substance. With sediment, charcoal, and carbon fitted filters – Express Water has manufactured a comprehensive filtration system for households. 3M Aqua-Pure AP903 $$ 20GPM 100,000 Gallons 20" x 4"
3M Aqua-Pure AP904 $$$ 20GPM 100,000 Gallons 20" x 4"
Home Master HMF3SDGFEC $$$$ 15GPM 100,000 Gallons 20" x 4.5"
Home Master HMF2SMGCC $$$$ 10GPM 100,000 Gallons 20" x 4.5"
iSpring WGB32B-PB $$$$$ 15GPM 100,000 Gallons 20" x 4.5"
Express Water $$$$ 15GPM 20" x 4.5"
The critical difference between whole house filters and single-use filters is their point of installation and output. Whole house water filters are installed at the main water line that enters your home, as opposed to single-use filters that are installed at different faucets and taps for a single outlet use. All whole house filter systems serve a single purpose: every water outlet from your kitchen to your garden hose should have filtered, purified water. According to research, around a quarter of US citizens drink unsafe or contaminated water. Based primarily on the location you’re in, the pollution can have a variety of forms. Even though installing single-use water filters can help, these systems might not always be enough to ensure protection. If you have a need for filtered water that extends beyond just drinking and cooking, you should consider investing in a whole-house system. This is especially the case if you own a large home, where water consumption is above average. There’s a variety of diseases that polluted water can cause, and not all of them come from just ingesting it. Your shower, garden, and toilet water can all put your health at risk, even though you might not be in direct contact with the contaminated water. To determine whether you need a whole house water filtering system, the best thing to do would be to assess the quality of your water. There are different ways how you can do this, and it’s an important step towards cleaning your water from pollutants. If you’re dealing with various type of contaminants, a multi-stage filtering system is your safest bet. It can protect your health and ensure that you don’t have to worry about your family getting in contact with any of them. There are many things that contaminate your water. From microbes to organic chemicals, understanding the nature of the contaminants will help understand how they affect your water and why it’s necessary to remove them. Physical contaminants are the most easily traced and easily eliminated contaminants found in water – often changing the appearance of the water to signal contamination. Sediment is the most predominantly found physical component, although dirt may also be found in water supplies. Such contaminants pollute water and affect its taste and appearance, rendering it unsafe for human consumption. Biological contaminants include microorganisms, such as viruses, bacteria, protozoa, and parasites. Common contamination sources include rainfall, snowmelt, and sewerage systems. Not only are they not visible to the naked eye, but they are also dangerous as drinking contaminated water can cause several gastrointestinal diseases and infections. Chemicals, such as toxins produced by bacteria, heavy metals, sprays, and pharmaceutical waste, pose great health hazards. Some chemical contaminants may not be visible to the naked eye and consumption of such can adversely affect human health. Radiological contamination of water resources and supplies is rare, but also one of the most dangerous; posing a huge risk to anyone who has consumed the water. Coal mining, uranium milling, and nuclear power production are the primary causes of such contamination. Whole house filters deploy several different types of media types. Filtration media type, a powdery substance that varies in thickness, is the main component of water filtration. Filtration media acts as the workhorse of these systems and rids water of many impurities. The type of impurities that get eliminated depend wholly upon the media. Sediment is the single biggest contaminator and is found almost anywhere. Not only is it harmful for human consumption, once it makes way to your household, it is also equally harmful to your pipelines. Sediment can lower the water discharge rate from your taps, as well as deposit at the bed of your storage tank and reduce its capacity. Sediment infected water is traceable by its cloudiness, change in color, and a foul taste and smell. Sediment filters remove sediment particles from entering your home by filtering them out of the system. Sediment filters are the most affordable of the lot, due to the fact that stopping sediment is easier and possible with higher micron rated filters. However, these filters are very one dimensional and serve no purpose besides removing sediment. Carbon filtration provides an upgrade on the basic sediment filters and targets a majority of contaminants that may cause water appearance and taste to deteriorate. Granular Activated Carbon (GAC): Traps and dissolves large contaminating particles. Best choice for pre-filters and chlorine elimination. Block Activated Carbon (CTO): One of the best choices for chlorine elimination. Eliminates large contaminants as well as some heavy metals, such as lead. Works best in conjunction with GAC. Catalytic Carbon: Allows for decomposition of hydrogen peroxide. Especially developed to restrict chloramine level in the water. KDF is a specially manufactured copper-zinc formulation that is effective in removing several harmful substances such as lead, chlorine, mercury, iron and hydrogen sulfide from the water supply. When paired with activated carbon, KDF reduces bacteria, fungi, and algae along with a host of other contaminants. UV filters are a recent addition to the line of filters, as they utilize modern technology to eliminate microorganisms in the bacteria. They are highly effective, eliminating 99.99% of the bacteria – but here’s the catch, they are unable to eliminate other water contaminants besides microorganisms. This is why these filters are often used in conjunction with other filters. Flow rate is the amount of water that can run through your water outlets. It is measured in gallons per minute (GPM), and you can find this information by checking the labels on your water appliances. For example, an average toilet flow rate is 5 GPM, while a dishwasher uses 3 GPM. This primarily depends on the size of your home and the number of occupants. In general, the required flow rate can range between 15 and 45 GPM. A filter system below the recommended flow rate might interrupt the usage of different water appliances. The pressure might be too low at peak usage, which could make things like showering and dishwashing inconvenient and uncomfortable. Consumption is another hugely important factor to consider. Without measuring it, you might make a mistake of going with a filter that you’ll have to change too frequently, which might result in quite some wasted money. The opposite situation can be equally bad. If you’re household doesn’t consume that much water, and you go with a filter that can last for years, there’s a chance that it will get clogger at one point, which can reduce its effectiveness by a lot. Typically, the common processing capacity of whole house water filter ranges from 50,000 to 1,000,000 gallons. You can see the Home Master 3 Stage Water Filter can only process 100,000 gallons, and the Aquasana Water Filtration System can handle 1M gallons before changing the filter cartridge. To check the water consumption of your household, just take a look at your water meter and write down the values. Then, keep track of all the changes until you can calculate the average consumption. Port size has a big impact on water pressure. It’s important that you find the size that fits your piping. Thankfully, this isn’t hard, as most homes can go with a port size of 1". Even if you use smaller pipes of 3/4", there should be no issues if you attach a 1" port to them. These are the four most important factors that you need to consider when buying a whole house water filter. If you find the right one, it will bring many positive changes into your life. Depending on the scope of their capabilities, there are two filter types that you can choose from - simple taste & odour filters and high-efficiency filters. Let’s take a look at the main differences between them. These are pretty self-explanatory. Their main job is to filter out the compounds that affect the taste and smell of your water, primarily chlorine. Some types might also be effective at dealing with sediment, as well as preventing scale from building up. These filters are generally affordable, since they serve a fairly limited use. They’re great if chlorine and sediment are your only issues, but won’t do much when it comes to removing any other contaminants. For that, you need a more advanced solution. If you need a comprehensive solution to all your water issues, these filters might be the perfect choice. The stages that contaminated water needs to pass through to get to your outlets ensure that pretty much all pollutants are removed. They usually feature carbon block filters used in conjunction with ceramic, sediment, GAC, and even KDF filters. As a result, they remove the majority of contaminants, including VOCs, heavy metals, herbicides, pesticides, and virtually all microorganisms. Of course, this kind of power comes at a price. These filter can usually cost three times as much as the simple taste and odour ones. Still, their capabilities justify the price, as they can make sure nothing but completely clean water passes through your plumbing system. Due to a variety of problems that hard and polluted water can cause, installing a whole house water filtering system can bring a variety of benefits. Once you install a whole house system, you won’t have to worry about any water-related issues for a long time, provided that you maintain it properly. Chlorine can have a negative effect on the taste of your meals and beverages. Whenever you make soup, tea, or even just wash your vegetables, clean water will make them taste far better. This will allow the natural taste of your foods to come out, so they’ll taste richer and more robust. You’ll also eliminate the need for buying bottled water, as the quality of your tap water will likely be the same. Magnesium and calcium found in hard and polluted water can have a detrimental effect on the look and quality of your clothes. They make your clothes lose color much faster and become more susceptible to tearing. Not to mention that if you keep washing your clothes in polluted water, they’ll lose their softness and might even damage your health in case there are many harmful compounds. Filtered water will give your clothes and linens softness and preserve their color for a much longer time. This will also save you money that you’d have to spend on replacing ruined clothes. Every appliance in your home that relies heavily on water is prone to damage if the water quality is bad. As sediment builds up, you’ll start noticing reduced water flow, and your appliances might start malfunctioning. Filtered water helps extend the lifespan of your appliances by ensuring that there’s no chlorine or sediment that can damage it. This can save you a lot of money in the long run. When you feel your skin drying out, the most logical thing to do is to soak yourself in the bathtub to rehydrate it. If your water is polluted, this will actually cause even more issues. Chlorinated water is known for causing dry skin and hair. If you keep bathing in it, the problem will only get worse. Once you start using filtered water, you’ll likely notice that your skin and hair are much softer. You’ll be able to manage your hair more easily, and it will be less prone to breaking. Also, if you’ve color-treated your hair, filtered water will preserve its color for a longer time. As you saw in the previous sections, there are numerous health issues that polluted water can cause. From mild skin irritation to cancer, these health risks are something you don’t want to expose yourself to. By going with filtered water, you might greatly reduce these risks. This is especially the case if your water contains a lot of heavy metals and VOCs. With the right water filter, you won’t have to worry about your water causing any health concerns. The information provided in this article should help you gain a better understanding of how to find the perfect whole house water filter. If you believe that you’re one of the 63 million Americans who drink polluted water, you should at least get your water tested to see if there’s anything wrong with it. If there is, follow this guide to find the best solution to this issue. Once you find the right water filter, polluted water will no longer be an issue.